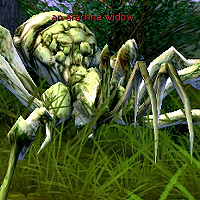 2:49:00 PM Sorry for blank post --my bad and new at this I've had one for awhile (gift from Fuzzgau)alos Have taken widow with me to DWB and he kicks A$$. Imagine my joy when I sent him to poison the DWB Overlord --Ah A thing of beauty! 7:35:00 AM I'm also keen to purchase this pet. Have looked long and hard for babies. If your on the Ahazi server and want to sell one please let me know. 10:10:00 PM is this the highest HAM creature tameable? 2:16:00 PM If anyone has one of these for sale on the Valcyn server please setn /tell or email fergalsut. I am a very serious buyer for one of these! 12:37:00 PM which mounds they spawn from ? just the ones with widows and queens or from others, too ? 11:37:00 AM Fuzzgau, it's a trade off, the Webmaster may do 10 more damage, but the Widow has a considerably higher HAM and Resists. 8:47:00 PM Had one for awhile. This is a keeper pet, and can't wait for a pvp encounter! 8:34:00 PM Have now killed dozens of widows, half a dozen queens, and emptied out six lairs completely -- no baby sightings. 4:06:00 AM umm, is this possible to get widow missions? 5:21:00 AM Seen a lair today, about 500m from the Research Outpost. I seem to find them either on Monday or Tuesday, around 8pm Hawaii time. I have always seen one at these times on Ahazi.